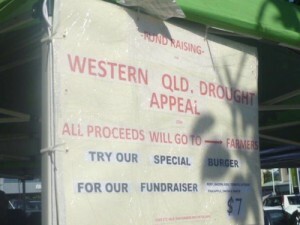 The Wynnum Manly & Districts Men’s Shed are very proud of the way the general public have got behind them in raising money for the farmers and the farm workers in the Western Qld drought areas. “We’d like to thank The Golden Crust Bakery in the Manly Village Shopping Centre for their outstanding support in donating all the bread and bread rolls for the day and that was great. Our men from the Men’s Shed worked from 6am until we run out of food, and there were 16 men on duty and they enjoyed the day.” said Wynnum Men’s Shed representative David Westlake. The Men’s Shed raised the great sum of $1,200, which is now on its way to give some families a better Christmas. The Charleville Rotary Club will distribute the monies where needed.